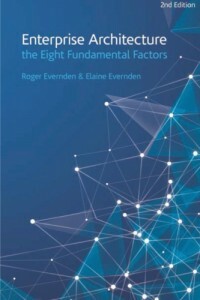 A new title: Enterprise Architecture – the Eight Fundamental Factors. A major rewrite and rearrangement of the content, new content, and additional diagrams and charts. Practical advice, examples and case studies showing exactly how successful enterprise architects can make a real difference. The book is independent of any particular EA approach. The factors described in the book are true for all enterprise architecture (EA) approaches. You will find them in The Open Group Architecture Framework (TOGAF), the Zachman Framework, and in every other EA methodology or framework. It provides a combined, integrated EA approach. The eight factors are, in effect, a meta-framework – a super-set of factors drawn from research into most of the other EA frameworks. The book shows exactly how these common factors are used in practice, and it demonstrates this with details drawn from a wide-range of EA initiatives. Note: the first edition was published in 2003 under the title “Information First”.